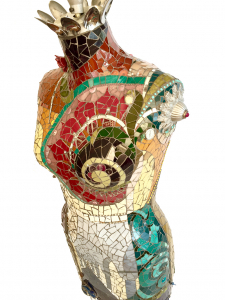 Metal worker Robert Biron and his life partner Marylène Ménard, a stained glass artist and mosaicist, make fascinating, playful works of art covered in mosaics and giving everyday objects a second life. By combining their skills and employing traditional techniques, these artisans create multicoloured, contemporary ‘menageries’, which are both original and surprising. The universe they create, populated by large wading birds, horned antelope and mouflon heads and colourful pictures adorned with popular floral designs, brings joy to young and old. A visit to this exhibition, featuring these eye-catching works of art, will stop you in your tracks.